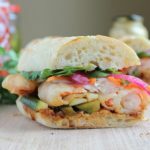 Shrimp Tempura Banh Mi!! 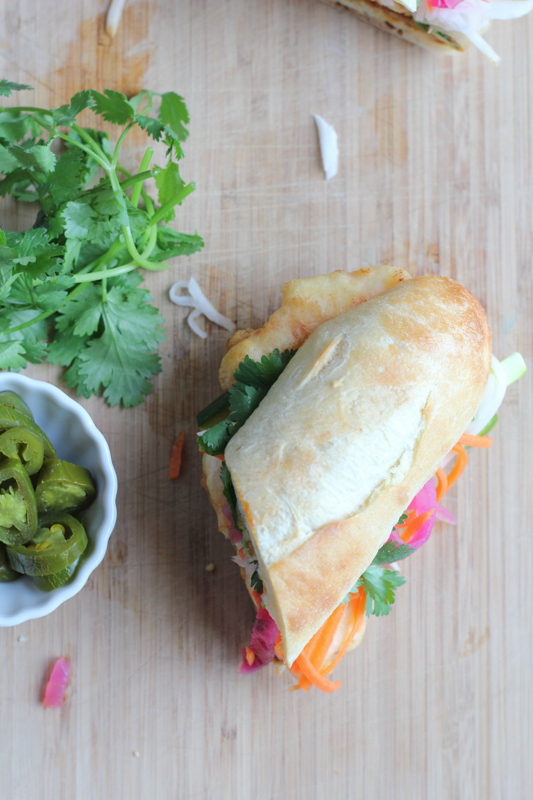 Shrimp tempura, pickled onions, veggies and everything else you get in traditional Banh Mi! You have to try this! This is what happens when you’ve had one too many traditional Banh Mi sandwiches and you want to take a stab at making it better. I mean beef, chicken, pork, and even tofu. . we’ve all had that before right? 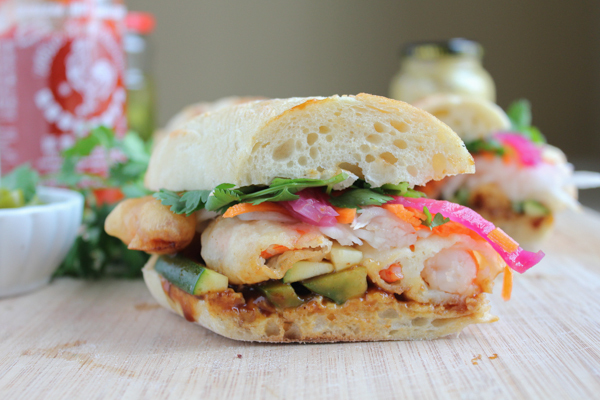 But have you had a Shrimp Tempura Banh Mi? Do you see that big hunk of shrimp tempura?! Flavor, texture, crunchy shrimp tempura, perfectly sweet and tangy pickled vegetables, all on a freshly baked French Baguette? This is heaven. One of the best things I’ve made. Notes for the Cook: -If you are not able to pickle the vegetables the day before and refrigerate overnight, leave them in the pickling juice for at least 1-2 hours before using. – If you have leftover tempura batter mix, coat some carrots, green bell pepper strips or zucchini strips and fry them up! 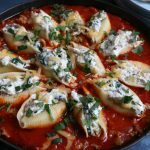 Using your KitchenAid® 9-Cup Food Processor fitted with the slicing disc, and adjusted to the size you want your onions, place your 1/2 red onion in the largest opening of the wide mouth food tube. Turn on food processor on LOW and press the onion down into the food tube. Remove the onions and blanch the sliced red onions in a saucepan of boiling water for about 2 minutes only. Drain and place directly into a mason jar. Going back to the KitchenAid® 9-Cup Food Processor, replace the slicing disc with the julianne disc and place your carrots (as shown in the photo above) into the largest opening of the wide mouth food tube. Turn on food processor on LOW and press the carrots down into the food tube. Remove the julienned carrots, place into a separate mason jar and repeat with the Korean radish. Heat the vinegar, water, salt and sugar in a medium-sized saucepan over high heat, whisking until all of the sugar is dissolved. Bring to a light boil and then pour over the red onions, carrots and radishes, individually in their mason jars. 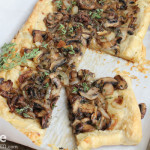 Let sit until the liquid has cooled, for about 25-30 minutes and place into the refrigerator overnight. The pickled vegetables will keep for several weeks in the refrigerator in the covered Mason jars. Place the hoisin sauce, sesame oil, mirin, minced garlic and honey into a small bowl and whisk until thoroughly incorporated. Taste and adjust any ingredients as necessary. Set aside. Using a large mixing bowl, combine the tempura batter mix with a 1/2 cup of water and mix well. The consistency should be similar to a pancake batter. Add another 1/4 cup more of water if needed. Mix and set aside. Using your KitchenAid® Streamline Cast Iron 4-Quart Casserole dish or large stainless steel pan, heat your oil (peanut, grape seed or canola) over high heat. The oil temperature for frying should be between 350-365 degrees. (Tip: if you do not have a thermometer, place the end of a wooden spoon into the oil. If you see bubbles form around the wood and they start to float up, your oil is hot enough to cook with.) Prep a paper towel lined plate, along with your spider-frying utensil and begin frying. When your oil is ready, dip your clean, deveined, tail-less shrimp (one at a time) into the tempura mix batter and directly into the hot oil. 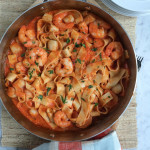 Repeat until you have a single layer of shrimp in your pan, none overlapping each other. You want each shrimp to have plenty of room in the pan. You can now turn the heat down slightly to medium-high. Allow the shrimp to cook, on each side and remove when the golden crunchy exterior has formed and you can see that the shrimp is cooked and has turned pink. Remove from the oil and onto the paper towel lined plate. Repeat until all of your shrimp has been cooked. If using, spread on some mayonnaise and then the hoisin sauce mixture in the toasted French bread baguette. Top with the fresh green bell pepper and zucchini strips. Layer on the shrimp tempura and top with the pickled vegetables and fresh cilantro. Serve with sriracha sauce and jalapeños if desired. 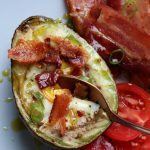 So, you simply must head on over to KitchenAid’s blog to read the rest of this post AND to get this recipe. . and I want to know what you think!! Brilliant or would never try this?? Please leave me a comment!! 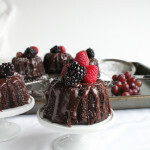 Either here or on KitchenAid’s blog page after you’ve read the post and recipe. 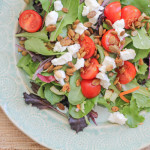 Simple Salads and Healthy Snacking with SuperSeedz, Gourmet Pumpkin Seeds + A Giveaway! 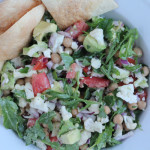 Love all the different components of this sandwich, love it! 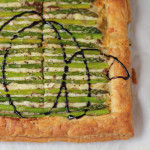 Always in love with you food and the delicious ways you have of reinventing old faves. Yes to tempura and a double yes for it Banh mi style too! Oh baby, that looks so freaking good! 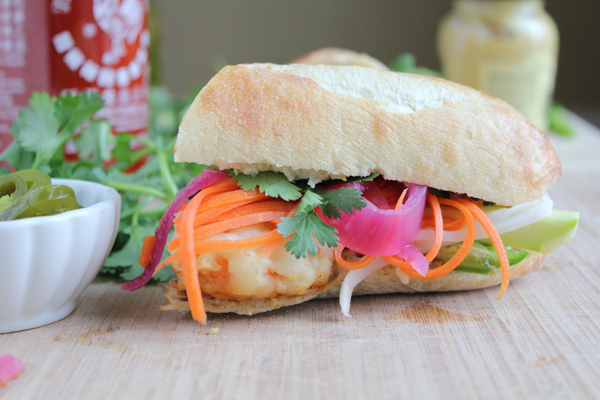 Banh mi is the best and you’ve just taken it to another level by using shrimp tempura. I love the way your mind works! haha, thank you Nancy! This was freaking fabulous. . I love banh mi! This is such a fun and creative take on it! There is a place in NYC that I absolutely love called Num Pang. They do all sorts of riffs on Banh Mi sandwiches that my wife and I absolutely love. 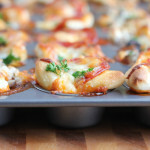 Your pictures are making my mouth water! 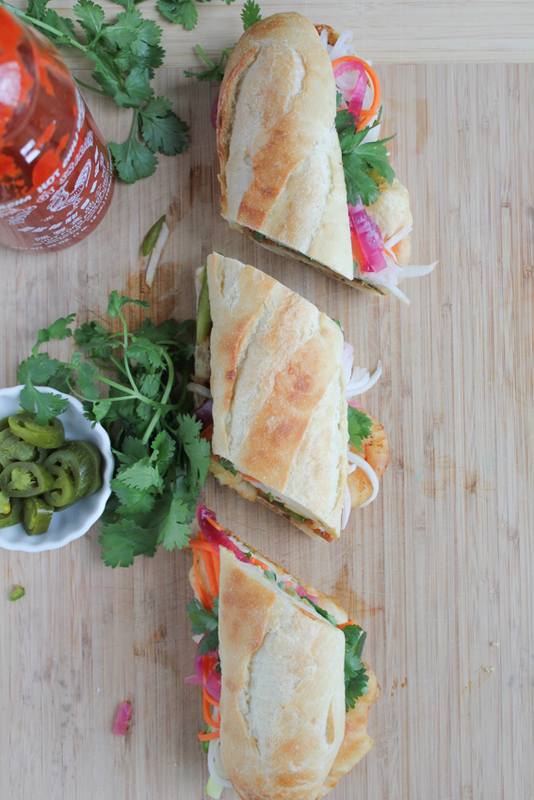 Love the sound of this banh mi!